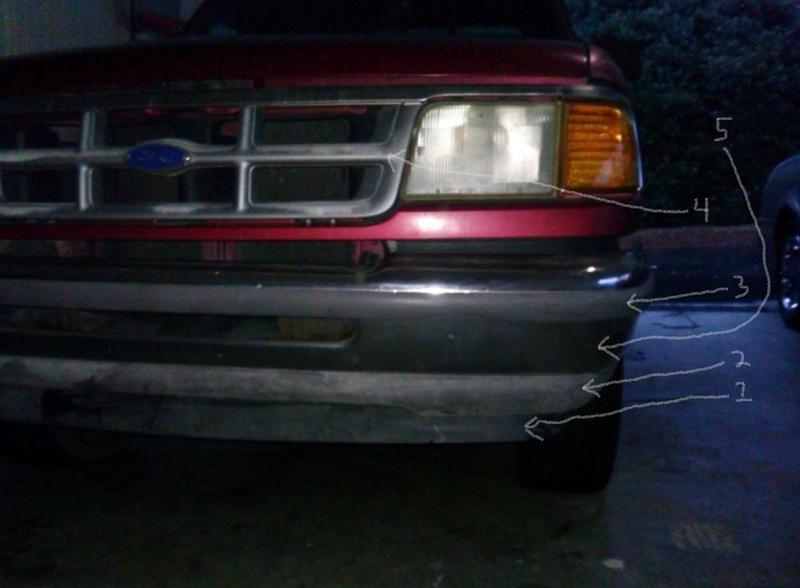 I am wanting to get new front bumper parts and I need help identifying the names of the four parts. Please see my picture attached. I have 5 parts pointed out. I assume number 5 is parts of the bumper itself.. I am wanting to get numbers 1, 2, and 3 in black, not faded gray like it is. I am also wanting to get number 4 in chrome. The one on the truck is scratched up and I want to replace it. Can you guys help me name these bumper parts and do you guys know a good place to order them? Any help would be appreciated. Looking at my Haynes Ranger Manuel, I believe numbers 1 and 2 is called a Valance Panel. Numbers 3 and 5 is the actual front bumper and number 4 is called a Radiator Grill. Is this correct? Need help identifying these wheels, and will they work on my truck? Front fenders changed after '07? Quick Reply: Identifying front bumper parts?? ?